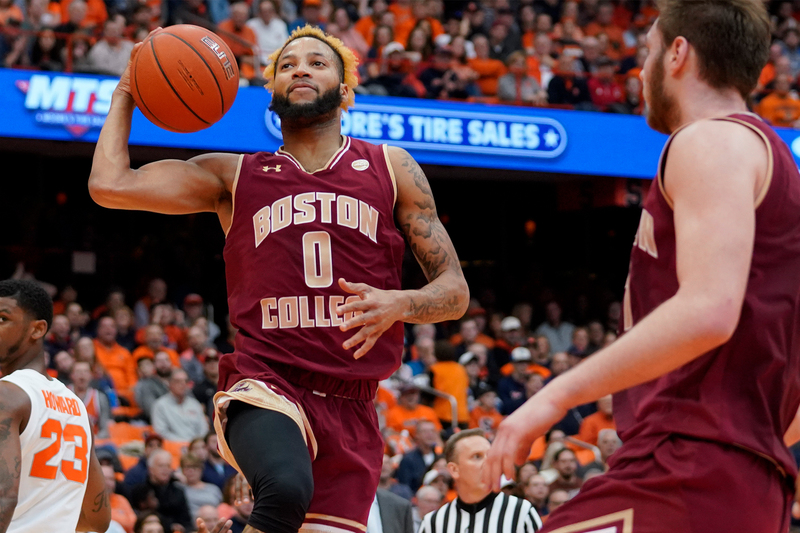 SYRACUSE, N.Y. – Boston College’s 14-0 run late in the second half cut it to six – 60-54 – with 3:54 to play but it was not enough as the Eagles dropped a 67-56 decision at Syracuse. The Orange forced 18 turnovers and held BC to 33 percent shooting from the field at the Carrier Dome. The loss dropped Boston College to .500 on the season at 11-11 overall and 2-8 in the ACC while the host Orange moved to 17-7 overall and 8-3 in ACC play. Syracuse outscored BC 25-5 in points off turnovers and held a 30-16 advantage in the paint to secure the win. The Orange led 31-24 at the half behind a strong performance from the bench. Syracuse held a 16-7 advantage in bench scoring in the opening 20 minutes as freshman Buddy Boeheim led the way with 11 points. Boston College was outscored 10-0 in points off turnovers in the first 20 minutes and made just one of nine from behind the arc. The Orange were 5-of-12 from three-point range in the first half. Nik Popovic led BC with eight points, three rebounds and two assists in the first half before leaving the game early in the second half due to injury. Ky Bowman, who did not start, scored seven points off the bench in the first half. Syracuse held its largest lead of the game at 60-40 with just over eight minutes to play before BC responded with a 14-0 run to get back into the game with 3:54 remaining. Bowman led BC with 21 points, including 5-of-8 from three-point range. Tyus Battle led Syracuse with 21 points while Boeheim finished with a career-high 16 points for the Orange. Ky Bowman led the Eagles with 21 points. The junior guard knocked down 7-of-12 shots from the floor, including 5-of-8 from beyond the arc. He added seven boards, two assists, and two steals. Bowman came off the bench and was not in the starting lineup due to a minor team issue, according to head coach Jim Christian. Jordan Chatman added 12 points while Nik Popovic had 10 points, five boards, and two assists. Popovic played 19 minutes before being knocked out of the game. He did not return (concussion protocol). Steffon Mitchell grabbed seven rebounds, including a team-best four on the offensive glass. He came out of the game due to injury in the second half but returned to the floor. Boston College was without freshman guard Wynston Tabbs for the fifth straight game due to a knee injury. BC’s bench outscored the Orange 29-23, due in large part to Bowman’s efforts. Jairus Hamilton added six points on the afternoon. Boston College held a 37-34 advantage on the boards, including 15 offensive rebounds. Today’s game marked the 75th meeting between the two schools. The Eagles moved to 26-49 all-time vs. the Orange, including 3-9 in ACC play. +6: Boston College held a plus-six advantage on the offensive glass as the Eagles pulled down 15 offensive boards. It yielded 11 second-chance points for the Eagles. Ky Bowman was the lone BC player in double figures for efficiency. Bowman posted a game-high 25 on the afternoon. Efficiency rating is calculated using the following formula: (PTS + REB + AST + STL + BLK – Missed Shots – TO). Boston College returns to action Tuesday, Feb. 12 at Conte Forum versus Pitt. Tip-off is at 7 p.m. on ESPNU. Rich Hollenberg and Debbie Antonelli have the call. The game can also be heard live on the Boston College IMG Sports Network (WEEI 850 AM) with Josh Maurer and Danya Abrams.